I have been wanting to make a barn door out of old pallet wood for quite some time. The guest bathroom in my home is also the laundry room and I’m not fond of guests being forced to see our dirty clothes and cluttered shelves. 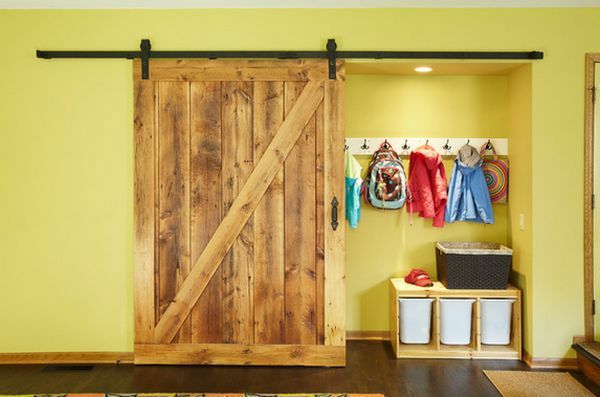 As you might be able to tell, there is no room for a typical door, but a sliding barn door should work well. I have done research on DIY barn doors and the various strategies for hardware, including steel bars, rods, pulleys, plumbing pieces, and re-purposed scooter wheels. I took all of the measurements and obtained some pallets last weekend. The boards will be disassembled, sanded, stained, then reformed into a barn door. I am looking at the option of using old bed frame steel as the track. The barn door is my first project idea. Once I get a bit further into the barn door project it may prove to be more involved than possible to complete on time. The second project I am working on is glass yard art using repurposed glass ashtrays, saucers and serving pieces to create decorative glass flowers for the yard. Fun idea to upscale your house at the same time. I saw your comment that your pivoting to your plan B for the upscale project. How are you going to merge the glass together: Will it be a wire frame or clay mold holding the structure together? Or heating the glass till it fuses together? I really like the idea of a barn door. We had one in the house that I grew up in. One thing that I didn’t think of until it was installed, was how heavy the door really is. It is super important to have a solid structure for the rail that it sits on. The other thing that was really surprising was how loud it was when it rolled. The entire door rumbles when it is closed but it isn’t a bad sound, more like rumbling thunder. Good luck with this! Thank you, I think I will need it. I am moving on to plan B for the moment but maybe the barn door will be my main project. It is taking a lot more time than I thought and I really want it to be beautiful. Good suggestions about the weight and noise. I was thinking of using roller blade or scooter wheels instead of pulleys to help with the latter. Thank you again for the suggestions.